This is flattest section of the trail; there is practically no grade. 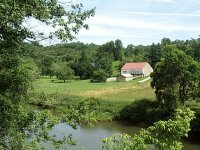 The trail closely tracks along side the Gunpowder Falls River, which make it very nice during the summer. You will often see tubers in the river or hiking back up the trail. (I'm also told there is some good trout fishing on the river). During my last visit to this section (June 2001), the trail was in very good condition. There appears to be more amenities along this section these days, including a bike rental shop at the Paper Mill Road crossing. The trail was also surprisingly dry despite some unusually heavy rain the prior two days. 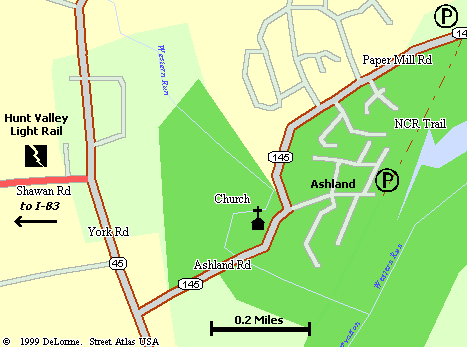 The trail head is located in a small housing community called Ashland. This is about one mile east of Hunt Valley Mall. Here, you will find a Light Rail Station, which I am told allows bicycles. The light rail will take you across town to BWI Airport, passing by Baltimore's Inner Harbor. From BWI, you can take bike routes to either Washington, DC or Annapolis, MD. These parking areas all accessed from Route 45 (York Rd). Use I-83 exits 20 or 24 to reach Rt 45. Mile 0.0 - Ashland: (LIMITED PARKING) A small housing development about a half mile from Route 45 off Paper Mill Road. Turn right into the development and head strait back to the end of the road. Mile 0.5 - Paper Mill Rd. New large parking area now available. Mile 2.0 - Phoenix: About 1.5 miles east off Route 45 using Phoenix Road. Mile 3.5 - Sparks: About 3/4 miles from Route 45 via Sparks Road. Mile 4.5 - Glencoe: From Route 45, take Lower Glencoe Road to Glencoe Road.